Rim Width Caliper with Metal Pointers for extra accuracy. 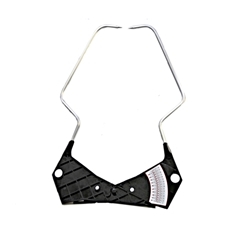 Rim Width Caliper with metal pointers, just one of a range of quality Tyre Changer Accessories sold by equipment4garages.com. Lightweight but strong. Easy to read scales on both sides. Scale Readout: 3" to 18"
Easy to read scales on both sides. E4G 5025 Wheel Balancer Wheel Rim Width Caliper with Metal P..